Last weekend I was lucky enough to visit the Close Knit exhibition at Hull Maritime Museum. The exhibition, organised in partnership with the Moray Firth Gansey Project and Hull School of Art and Design, featured a wonderful range of ganseys from Yorkshire and Scotland. A gansey is a knitted, woollen pullover, traditionally worn by fishermen around the UK and beyond since the 1800s and possibly earlier. Generally seamless, they were practical, comfortable and warm to wear, and provided some protection from the harsh conditions at sea. They were generally designed to be fairly tight fitting, with an underarm gusset to allow ease of movement and sleeves which finished short of the wrist. Ganseys feature many different patterns and theses were often handed down through families and adapted and developed by different generations of knitters. Close examination of the garments also reveals very fine stitching indeed. 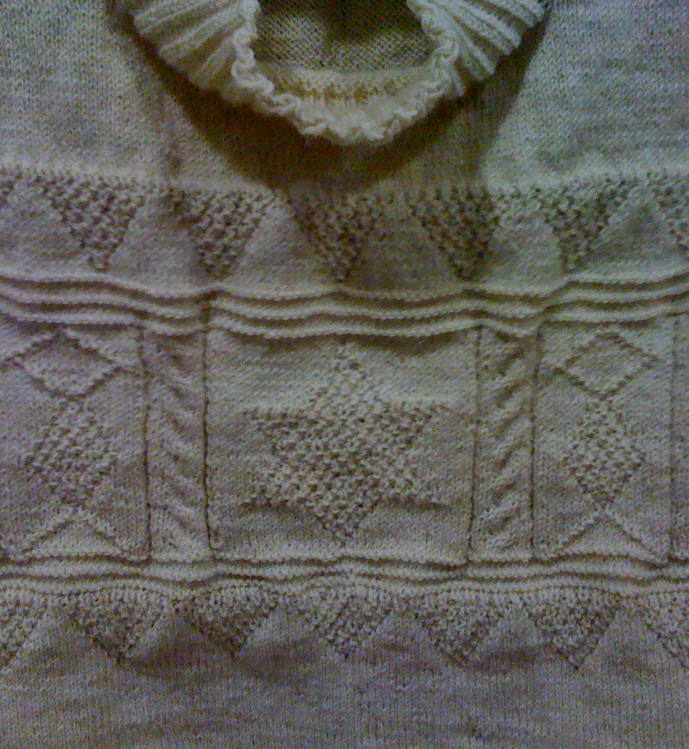 Ganseys were usually knitted in the round on very thin needles (sometimes bicycle spokes were used!) 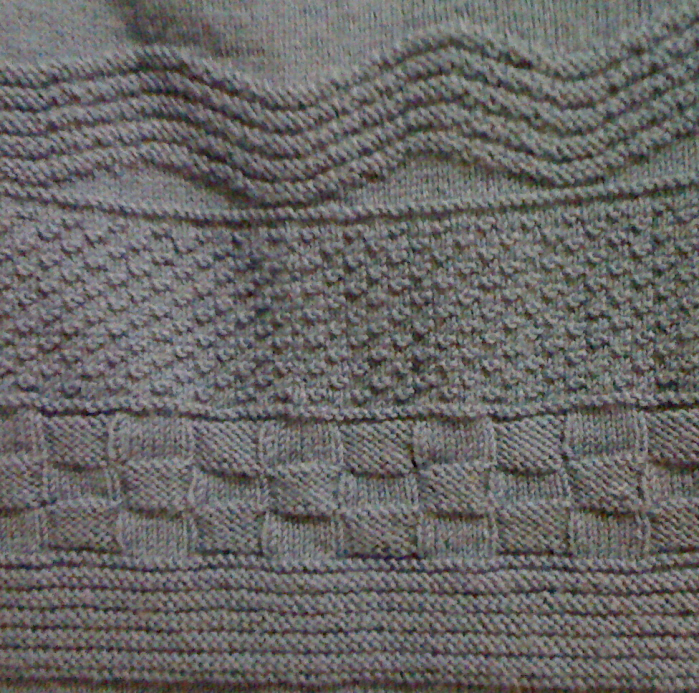 up to the armholes and often fake side seams were created with one or two purl stitches. 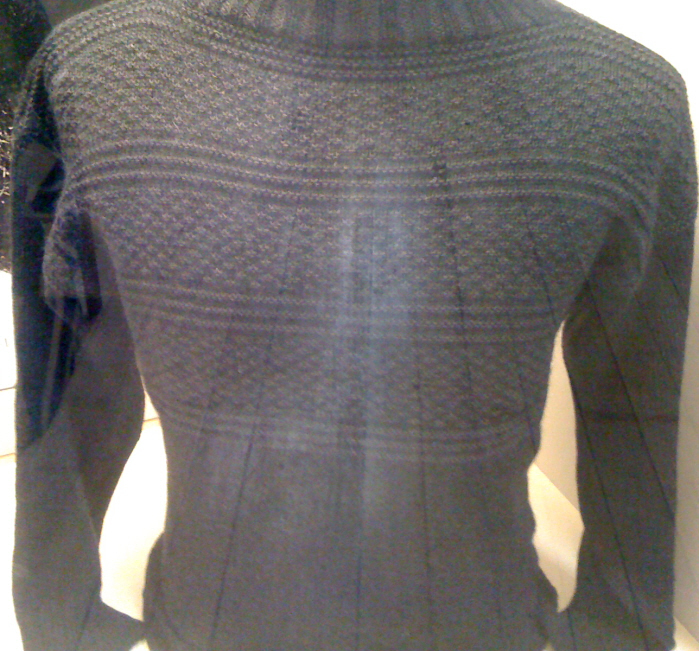 From the armholes, the front and back of the body were knitted separately and joined at the shoulder. Stitches were then picked up around the armhole and the sleeve was knitted down to the cuff. 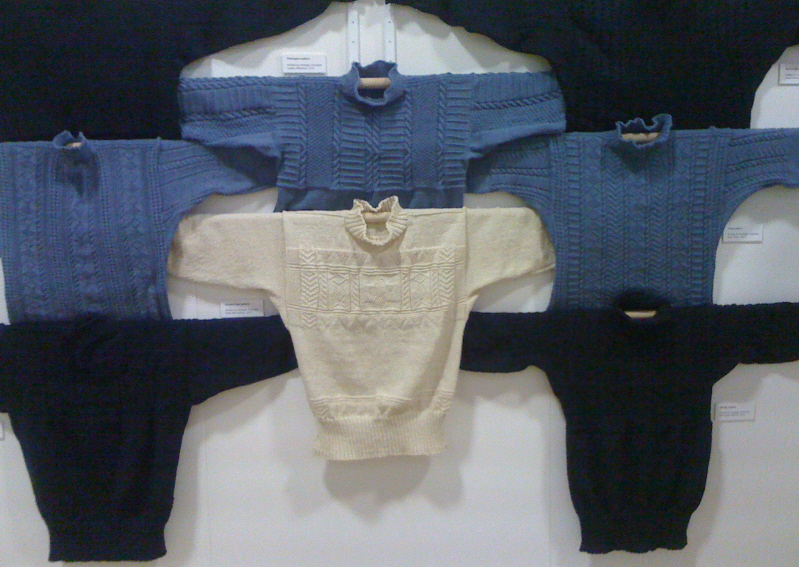 I can’t imagine the patience that must have been required to knit some of the ganseys on display, especially those knitting in dark colours in dim lighting – a real labour of love. The exhibition also featured a gansey belonging to the actor, Daniel Day Lewis, which had been passed to him by his father, Cecil Day Lewis. There were also lovely contemporary garments inspired by ganseys from designers including Di Gilpin and Alison Casserley and intricate textile work from students at Hull School of Art and Design. 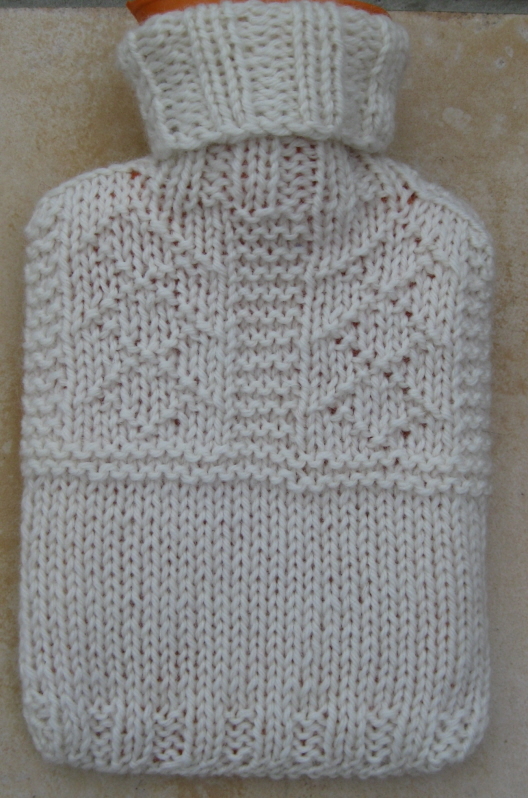 My own simple design, for a mini hot water bottle cover reflects the stitches used in a gansey but not the construction as the front and back are knitted separately rather than in the round. 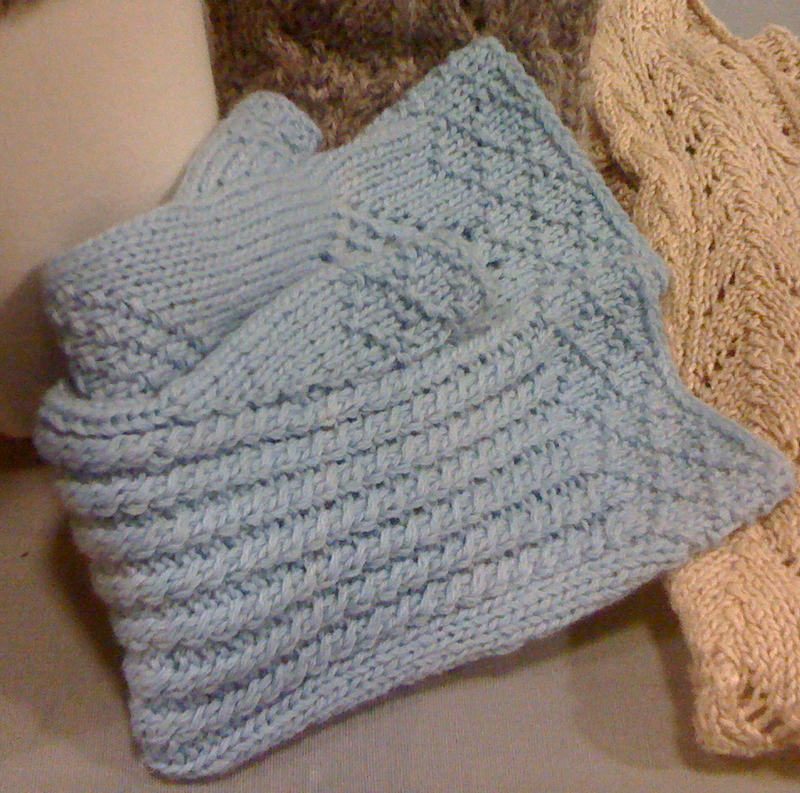 Knitted in aran weight yarn, it is a good project for beginner/improver knitters. Rows 1-4: *k2, p2, rep from * to end of row. Work 17 rows in stocking stitch (1 row k, 1 row p) finishing with a k row. Work another 27 rows in k2, p2 rib. Sew front and back together. Sew cast on edges together (there is enough room to insert the empty hottie through the neck of the cover). Sew side seam of collar.